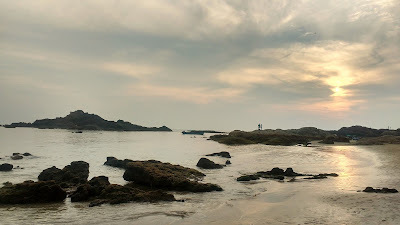 Gokarna - once a temple town with unspoiled beaches has been transformed to a prime backpacker hangout over the course of the past decade or so. The temple of Mahabaleshwara still plays a central role in the town affairs, however the pristine beaches are now the main draw. 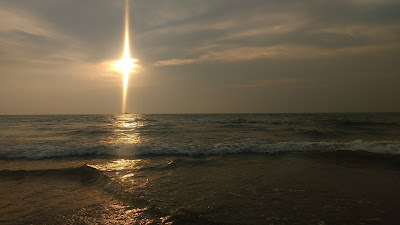 There's nothing much do other than soak up the sun, learn a bit of yoga, take a quick dip and chill on the sand - I think that is more than enough though. 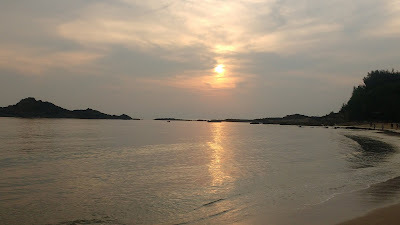 Gokarna is a place to sit back and relax. Gokarna has one railway station, but not many trains halt there. 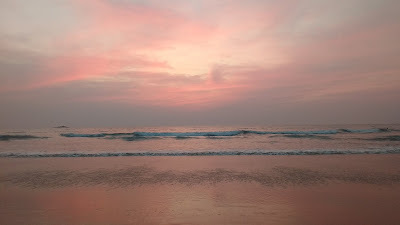 It is pertinent to get to Ankola to get a connecting bus to Gokarna. 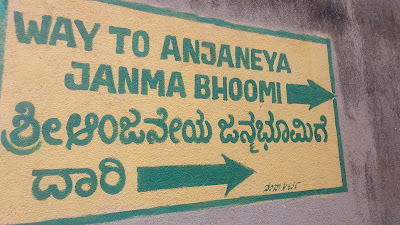 Ankola has good bus connectivity. 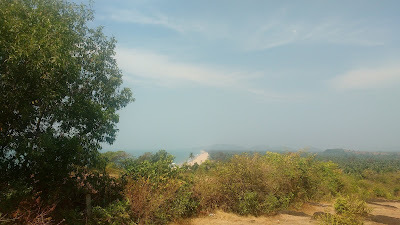 There are a few direct buses between Gokarna and Hubli as well. Rickshaws and rental scooters are available to get around places on Gokarna, but they are not very necessary of you are carrying light loads. There are a few ascents and descents so it is pertinent to understand your load carrying capacity. The Mahabaleshwara temple is the heart of Gokarna and is dedicated to Lord Shiva. The temple and Gokarna by large is also a centre for study of different facets of Hinduism. 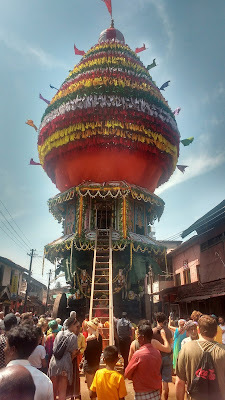 The temple has an annual jathra (fair) in the week following Mahashivratri. A chariot procession is one of the ceremonies. 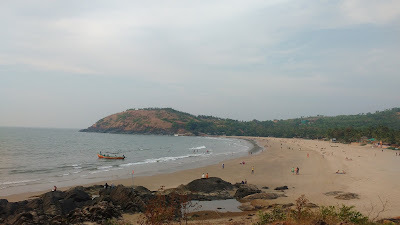 The Gokarna beach is a straight stretch of sand of about half a kilometer. 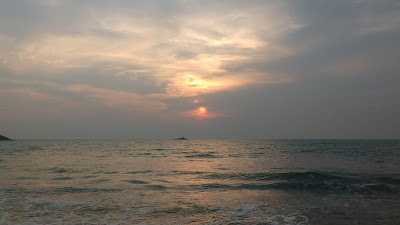 The primary function of the beach is religious, due to its proximity to the temple. 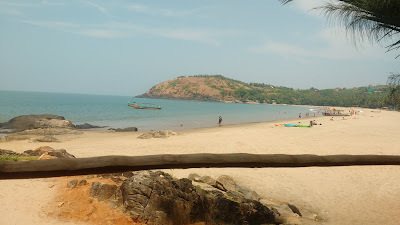 It takes about ten minutes for a walk from Gokarna bus stand to the beach via the temple. 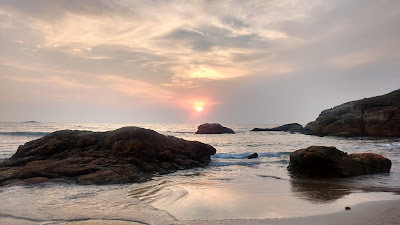 Apart from the main beach next to the temple, Gokarna has a handful of other beaches in close proximity - Kudle, Om, Half Moon and Paradise from north to south respectively. The Kudle and Om beaches can be accessed by road or on foot while the other two southern beaches have to be approached by local boats. 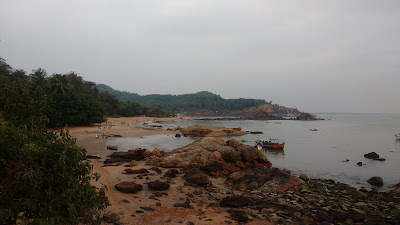 The Gokarna Beach Trail begins at Gokarna on the southern side of the Ganpati Temple. 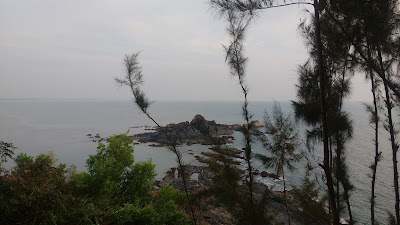 The road climbs up to an elevated plateau that overlooks the Gokarna beach. 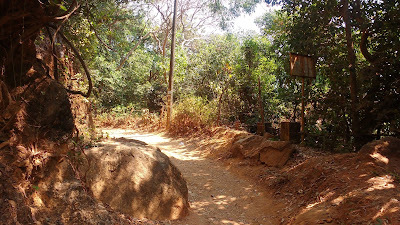 A little ahead, one come across the northern road-head for Kudle Beach. A descent from here leads to the serene sands of Kudle. One can enjoy the calm waters here or chill in any of the cafes. 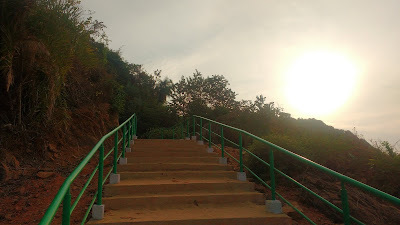 A flight of stairs on the southern side of Kudle beach lead to the plateau with the southern road-head. A south-easterly trail on this plateau leads to the road-head for the Om Beach. The descent for Om Beach is through another flight of stairs. One can continue to walk right up to the end of the Om Beach or chill out at any of the cafes. The waters in the northern half are not very safe for a swim. The trail possibly extends to other beaches down south, but I'm not entirely sure. 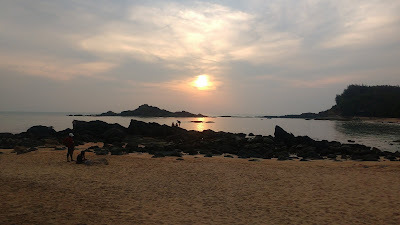 Well, Gokarna is a place that I would love to make my go-to chill-zone. The place has the right unspoiled ambience along with most amenities one needs. More trips will surely be planned! I really appreciate this article and Happy Independence Day to all proud Indians !! !